I recommend keeping records (pre and post-intervention) so you can monitor your progress. 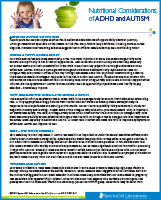 Autism Research Institute (ARI) offers a free Autism Treatment Evaluation Checklist (ATEC) in several languages. 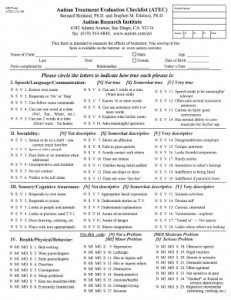 You can print out the paper ATEC form (here’s the paper ATEC in English), or take the online ATEC (available in several languages) which tabulates the score for you. I created this ATEC scoring guide to help you tabulate your score. Total scores of less than 30 – Indicate that the child possesses somewhat normal behavior patterns and communication skills and has a high chance of leading a normal and independent life. Total scores of less than 50 – Indicate that the child will most likely be able to lead a semi-independent life without needing to be placed in a formal care facility. Total scores of 104 or higher – Indicate that the child would fall into the 90th percentile and would be considered severely autistic. He or she will likely need continuous care, perhaps at an institution, and may be unable to achieve any degree of independence from others. If your child is a toddler between the ages of 18-24 months and you suspect they may have autism, please use the M-CHAT screening test. It is also helpful to shoot video along the way, so keep your camcorder/phone handy!